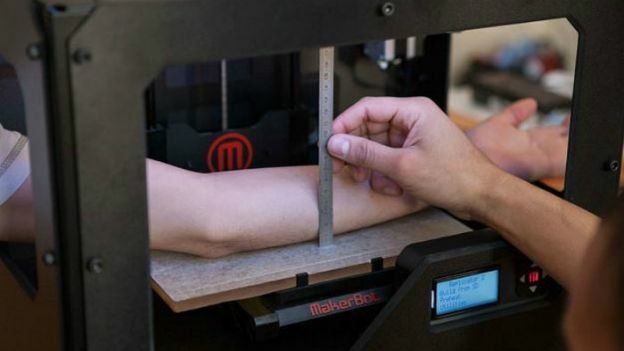 A group of French students have modified a MakerBot 3D printer into a tattoo machine thought to be the first of its kind. The combination of tattoos and tech was always going to happen. French design students Pierre Emm, Piotr Widelka and Johan Da Silveira modified the MakerBot 3D printer as part of a challenge set by France's Cultural Ministry. They managed to show the machine tattooing a perfect circle showing off its accurate precision and aimed to do it on human skin using a normal pen. After the competition, they borrowed a manual tattoo-machine from an amateur tattooist and practiced drawing on artificial silicone skin. They wrote on the Instructables website: "The big difficulty was to repeat the same exercise on a curve surface and on a material that has much more flexibility than silicone. Many tricks were tried to tighten the area around the skin (a metal ring, elastics, scotch tape...) but the most effective one was a scooter's inner tube, open on the area to be marked." The group of tech tattooists eventually found a willing volunteer, the first person ever to have a robot tattoo. Turns out someone documented the whole process and stuck in online, so if you happen to have a MakerBot 3D printer lying around head to the Instructables.com where the instructions are to make your own tattoo machine.